UPDATE! "Kissy" or "Jessie" (the shelter named her Jessie) has been given a second chance. She does not have a family at this time but Pet Pal Animal Shelter has agreed to take her in until a family is found. Surgery is needed to cure the entropion in both of her eyes. Once details are worked out, I will start a donation page to raise money for her surgery. Thank you to everyone out there who came together with the short notice. Hi friends. 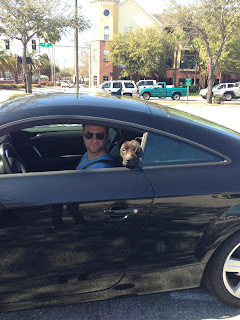 On Saturday morning on I-4, Gabe and I saw a dog cowering in the middle of the interstate. Along with a few other vehicles, we slowed down traffic and got the dog over to the side of the road. Although this dog was terrified, she instantly came over to me once I got out of the car. I could tell she recently had puppies and had been out on the streets for quite sometime. She gave me kisses upon first meeting me and my heart melted. I opened the car door (Audi TT, barely a backseat) and she jumped right in and sat with her head between Gabe and mine, snuggling both of us. This dog is a pit bull. I knew upon rescuing her that if I was to take her anywhere, her chances of being adopted were very slim. I could tell she had an eye infection as well. After speaking with the Sheriff's department and callling every single animal shelter in Hillsborough and Pinellas County, we were left with one option, The Hillsborough County Animal Shelter on Faulkenberg Road on Tampa. We were informed this is a low kill shelter and left her there with a heavy heart. I called this morning to check on the dog, who I appropriately nicknamed Kissy, due to the fact that she gave two strangers kisses non stop. I was informed that she has a medical condition called entropion in both eyes. This is when the eye lashes grow inward and she needs surgery. The animal shelter gave me the news I did not want to hear, that her chances of being adopted were slim to none and we have until close of business on Valentines Day to find her a home or she will be put down this Friday morning. I need your help to get word out there to find this loving pup a home. We live in a condo and it is against our HOA regulations to have a Pit or I would be down there adopting her right now. "Kissy" is 2 years old and weighs 40lbs. She is too sweet and loving to lose her life so young. "Kissy's" ID is 1511727 and you can find more about adoption on the Hillsborough County website by clicking here. Animals are available for adoptions at 440 N. Falkenburg Road in Tampa: Daily from 10 a.m. - 7 p.m. Please share this with anyone who you think can help. We are looking into the price for the surgery in hopes that a family can take her in. Thank you so much Kat. I really appreciate it! Thank you Nichole - I appreciate you sharing it! I shared on FB & Twitter. I sent it to Suncoast Animal League as well. Praying for this sweet girl. Thanks for being a good person and picking her up. Thank you so much! I have been told so many times that I was a good person today but I only see it as me being an animal loving human. It's really endearing though to hear that so many times in one day. Thank you, I will do that tomorrow. Worst case scenario, I am going to get her back and find her a foster home. We will not let her get euthanized. Shared. crossing fingers someone will come forward that can care for & love her. Thank you Courtney. I appreciate everything you have done! Hopefully we will find this girl a loving home. I am so relieved to hear you'll buy her some more time to find a foster! I'll keep sharing and please keep us posted. Thank you for rescuing her. I live in NYC & have a rescue (not a Pit) & it was the best thing I have ever done. Hopefully she will find a caring family that will love her and care for her forever. I will bookmark this page and check back for information on donations for her surgery as I would be happy to help make the surgery happen. I actually had a (human) friend who had this condition & it was very painful. The surgery was pretty simple & she was fine after it was all done. I'm sure. Kissie will be fine once she gets this taken care of.